Window Cleaning Solutions LLC is now proudly providing Luxury Window Cleaning Services to Sewall's Point, Florida. 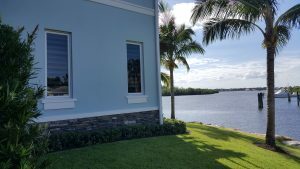 These beautiful homes have incredible views of our beautiful treasure coast and florida's wildlife like manatees, dolphins, and even iguanas! If you live on the Water like this guy… Your Windows will build up salt residue and Need to washed routinely. If you don't remove this salt over time it will build up and permanently etch the glass. At this point the glass must be polished or replaced to restore your view. And of course you want clean windows to see all this action from the comfort of your home! If your house within seven miles of the Ocean, you will get salt build up on your windows. Don't risk having to replace all of your windows! Call Us today to schedule your free estimate, (772)247-2716. You can Learn more about how to remove Salt from your windows here.